1) Plug in egpu as soon as windows logo appears. 2) Download/install nvidia graphics drivers. 3) Disable and enable audio drivers in device manager. (Required with each reboot). Timespy (8103 Score, 9945 Graphics Score, 3955 CPU Score) - Validation warning, 417.01 nvidia driver not validated by Timespy. Id appreciate feedback, help on a more permanent audio fix or any way I can teak or improve this! -Macbook Pro mid 2017 15"
I’ve got a nearly identical setup to yours and your post really helped me out with setting up my new RTX 2070 today. Only thing I haven’t got to work yet is audio so I just wanted clarification with what you said about disabling and enabling the audio drivers in device manager. Aka do you mean to disable and enable the devices themselves or is there something else I’m missing? Yes, correct, disable and enable the devices themselves via Device manager. Open Device manager via the search bar. Under Sound, video and game controllers: rightclick on each device and "disable". Some may require a reboot, if they require a reboot then do so. Re-enable the laptop speakers. This will allow you to plug in headphones/audio jack, or use the internal speakers. On the MBP17 they are listed as "Cirrus Logic CS8409 (AB57)". Every other driver is disabled, ie. "High Definition Audio Device" (x2) and "NVIDIA virtual audio device (Wave Extensible) (MDW)"
Additionally, under System devices there are multiple "High Definition Audio Device" tabs. One of these corresponds to the laptop internal speakers. Disable the others (if you disable the laptop speakers one, the device under Sound, video and game controllers will dissapear until it is re-enabled. On every restart, all redundant High Definition Audio Devices are disabled, however I still have to disable and re-enable the Cirrus Logic Cs8409 device to use the internal sound/audio jack. 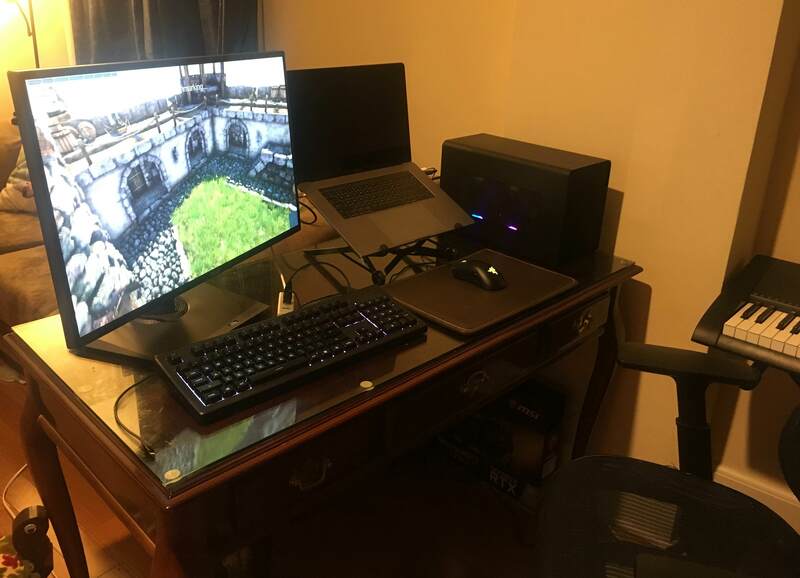 I have a setup with an identical MacBook to yours and gtx 2080 ti on an external monitor. Every time I power on I have to go through some trouble and reinstall the drivers. Sometimes the GPU is not detected at all and I have to go through several different reboots to have it recognized. Can you give me any more information on how exactly you start up your Mac every time and connect and disconnect from your egpu and let me know what I could be doing wrong? Sure Ethan, I hope I can clarify. You say you have a gtx 2080 ti, do you mean an RTX 2080 TI, or a GTX 1080 TI? Are you using a razer core X? The razer hardware detection greatly facilitates this build and was one of the deciding factors in my purchase of it, based off previous build guides and reviews. -Egpu TB3 connector not attached to macbook. -Power cable connected to egpu. -Power cable connected to macbook (top right, closest to screen). -Press the power button (top right hand corner of keyboard). -Hold down the option key (bottom left), this will allow you to choose which disk to boot into. -Press Enter to select the boot system (windows). -The windows logo will appear instantly after pressing enter. -As soon as the logo appears, carefully plug the TB3 egpu cord into the laptop (within 1 second). -If your external monitor has a "detect input" or "check input" option, activate these now. -Using "Restart" requires precise timing of when to disconnect and connect the GPU, with a high chance of missing the option to choose boot drive. -I recommend using "Shut down" and manually pressing the power button to restart using the above method. -Unplug eGPU after shutdown is complete. -If I am too slow to plug in the egpu, the card may still be recognized by the device manager, but will require a driver re-installation to allow a monitor to be detected. Restarting with the above method without reinstalling drivers has fixed the issue consistently. -Changing the TB3 ports on the mac I use, ie be switching the power and the egpu leads to the egpu not being detected, and seems to requires driver re-installation. Hey there! Just wanted to chime in and say BIG THANKS to @enky_bubu for creating this great thread. I have the same configuration of Macbook Pro and went ahead with the Razer Core X and Gigabyte GeForce RTX 2080 Gaming OC 8GB. Followed this guide to a T, and everything works great! The Windows logo gets stuck on the internal monitor while the external one runs Windows, but that doesn't seem to have messed up anything. I'd like to point out that you need to disable and re-enable the Cirrus Logic device that's in the Sound, Video and Game Controllers and NOT the Audio Inputs and Outputs section at the top. I was trying to disable it in the Audio Input/Output section and sound wasn't ever coming out.